John Vlissides, a member of the “Gang of Four” -- the authors of Design Patterns (reviewed here) -- presents another book on the subject. In part, this book presents some important aspects in using patterns; hence the subtitle “Design Patterns Applied” is right on the spot. Vlissides shows when certain patterns are used in real life, and even quotes a lot of e-mail from other users, showing patten advantages and, notably, weaknesses. 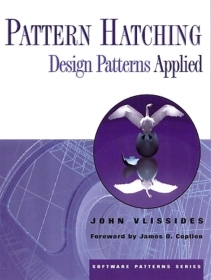 As Vlissides states, “This book conveys something very important that’s missing in the more academic and published Design Patterns book -- that patterns are the result of real, working programmers who don't get everything right the first time, and who struggle with the pragmatics of recurring design practices” (page x). Herein lies the book’s greatest strength. Another part is aimed for pattern writers, rather than users. Sadly, these is no clear separation between these two aspects of the book. Along with all the hoopla surrounding patterns these days comes more than a little confusion, consternation, and misinformation. This is partly a reflection of how new the field is to mainstream software developers even though it’s not, strictly speaking, a new field. It’s a fast-moving field too, creating vacuums of facts. And yes, we pattern proponents deserve some of the blame for not educating people as thoroughly as we'd like, though not for lack of trying. The book is basically a collection of Vlissides’s columns in C++ Report, and this is arguably the book’s weakest point: if you’re not intimately familiar with the little details of C++, you'll miss much of the action. This is sad, because the original Design Patterns book was careful to present patterns in a relatively language-independent manner, both in C++ and in Smalltalk. Here, the view is strongly biased towards C++, in ways that sometimes would annoy (or amuse) users of other languages, such as Smalltalk or Java. Chapter 2 is a tour-de-force of using “classical” patterns, those presented in the original Design Patterns book. The examples look a little forced, and life too simple (every problem has a corresponding pattern that fits it like a glove), and yet it is a most educating read. For one, relatively simple problem, the author comes up with an elegant solution that uses no less than six patterns (Proxy, Composite, Template Method, Visitor, Mediator and Singleton) -- and suggests an enhancement using a seventh one (Observer). This discussion alone could be worth the effort of reading the book, as it examplifies the correct and practical use of patterns in real life. The end of the chapter presents a very nice kind of diagram, invented by Erich Gamma, which could be very useful indeed. This “pattern:role annotation”, as Gamma calls it, allows people who are sufficiently fluent in the pattern language of design to immediately grasp the role of different objects, even in a large design. Chapters 4 and 5 are aimed mainly for pattern developers, though this is not clear when one begins to read them. It includes an example of the Gang of Four’s elaborate discussions about pattern design, with lots of quotes from e-mail messages, etc. This is interesting only to a certain extent. The discussion, basically, is about whether Multicast should be presented as a pattern in its own right, or as an adaptation of the Observer pattern. Most of the discussion seemed to be dealing with minute neuances, but the conclusion (the presentation of a whole new pattern, “Typed Message”), is a beautiful one. In conclusion, if you do a lot of object-oriented design, and use (or consider using) design patterns, reading this book can be a good use of your time; but unless you spend time on designing patterns, too, you might wish to simply skim the last two chapters. ''Another part is aimed for pattern writers, rather than users. Sadly, these is no clear separation between these two aspects of the book.'' This may be because there is not clear distinction in life. No one writes a pattern without having used them, in fact the act of writing a pattern is predicated upon unsuccessful attempt at use. Perhaps I was imprecise. Of course every developer who (knowingly) uses patterns also creates his own patterns at times. What I've meant is that some sections of the book are aimed at those developers who also attempt to document their patterns, with the aim of publishing the result. This certainly does not include the vast majority of developers.